Arsenal boss Unai Emery has warned youngster Emile Smith Rowe that he must continue to earn his chances in the first team as he looks to keep his feet on the ground. The 18-year-old impressed through pre-season for the Gunners after Emery included him in his travelling squad and gave him playing time to see what he could offer. As expected, opportunities for the senior side so far this season have been a little more hard to come by, but he netted his first competitive goal for Arsenal in the win over Qarabag on Thursday night, while he’s now made three appearances under Emery so far this season. 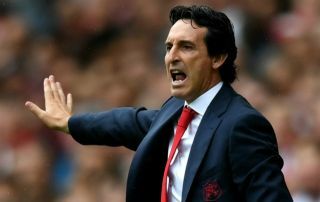 Nevertheless, the Gunners boss was seemingly keen to keep the youngster level-headed as he reminded him that he must not change his attitude and will have to continue to work hard in order to get another chance in the line-up. “It’s better to let him do his way with a humble spirit, working every day like he did in pre-season and now,” he said, as per The Mirror. Given the quality level in the senior side especially in midfield and further up the field, it’s likely to be difficult for Smith Rowe to displace anyone in the near future. However, if he continues to impress as he has done to this point, then Emery will surely have no option but to involve him more and give him minutes to help continue his development and avoid seeing him stagnate. In turn, a balance must be found. Particularly in the League Cup and Europa League, they would seem like ideal opportunities to let the youngster shine. That being said, Emery sounds like he’s got his approach to his new talent spot on.